PINEDALE, WYO. 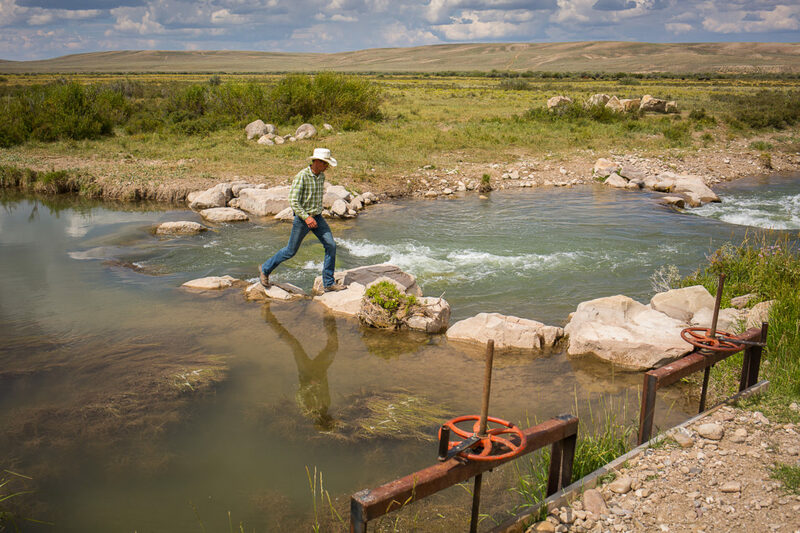 – When Freddie Botur, 45, whose ranch spans 72,000 acres outside of Pinedale, Wyo., first heard about a program that was paying ranchers to let water run down the river instead of irrigating with it, he was skeptical. But Nick Walrath, a project coordinator for Trout Unlimited, told him he’d receive about $200 for every acre-foot of water saved by not watering hay on his Cottonwood Ranch. For Botur, it would mean over $240,000 for fallowing just over 1,700 acres of hayfields for the latter half of the summer of 2015, letting 1,202 acre-feet of water run past his headgate on Cottonwood and Muddy creeks, tributaries of the Green River, instead of to his fields. 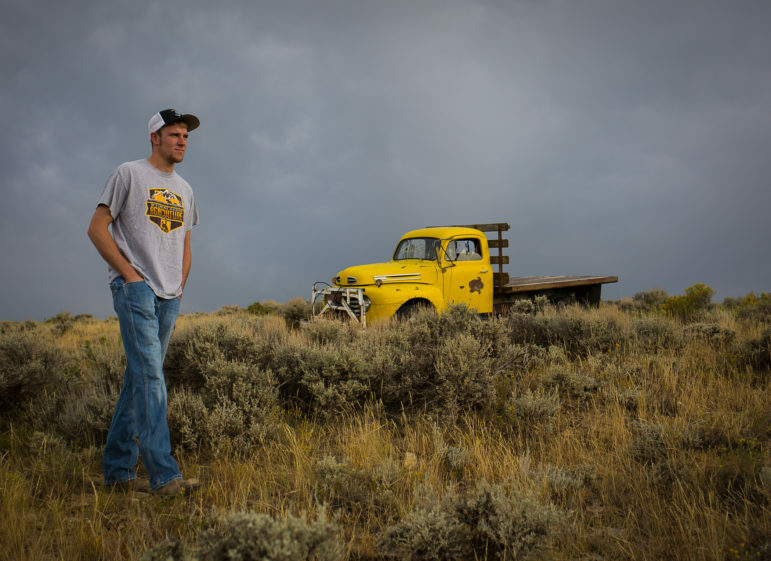 Botur, talkative and athletic, was wearing mirrored sunglasses and a cowboy hat when we met in June outside a cluster of old homestead buildings on the family ranch that he operates at the foot of the lofty peaks of the Wyoming Range. For Wyoming ranchers, he explained, the kind of money he received for not growing hay represented as much as a third of their annual revenue. The money-for-water program that Botur signed up for was a pilot program, launched in 2014 by the four largest municipal water providers in the Colorado River basin along with the Bureau of Reclamation. The goal: See how complicated it would be to pay ranchers to use less water on their fields and instead let the water flow down the Green, Colorado, and San Juan rivers to Lake Powell and Lake Mead, the two biggest water storage buckets in the Colorado River system. 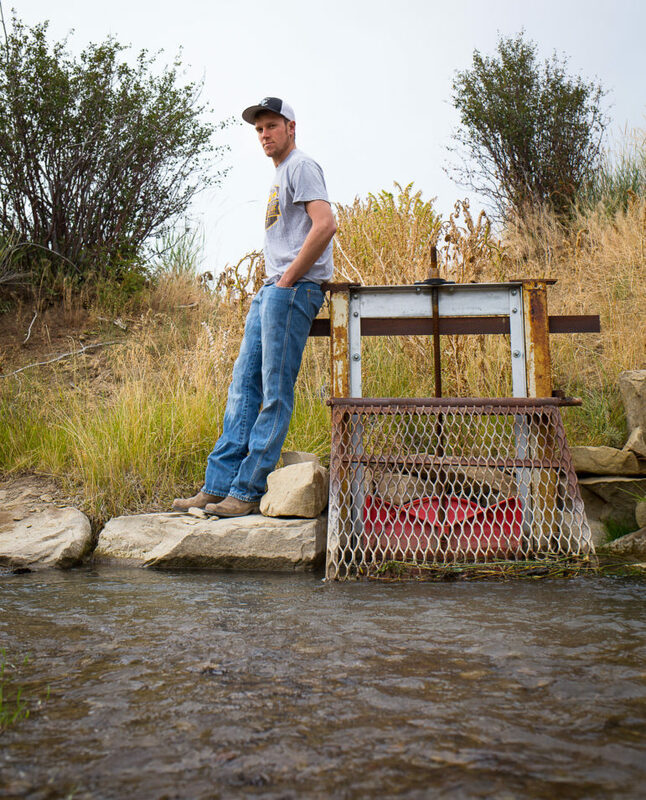 The result: After three years, the initiative, known as the “System Conservation Pilot Program,” proved popular with skeptical ranchers like Botur, but water officials called a halt to the program after this year until they work out some big challenges. Their task will not be easy. But as climate change alters the hydrology of the Colorado River Basin, water planners are searching for ways to adapt a system of century-old water laws to a new reality. If they’re successful, a revamped “system conservation program” could be one way to reshape water management for a hotter, drier West. 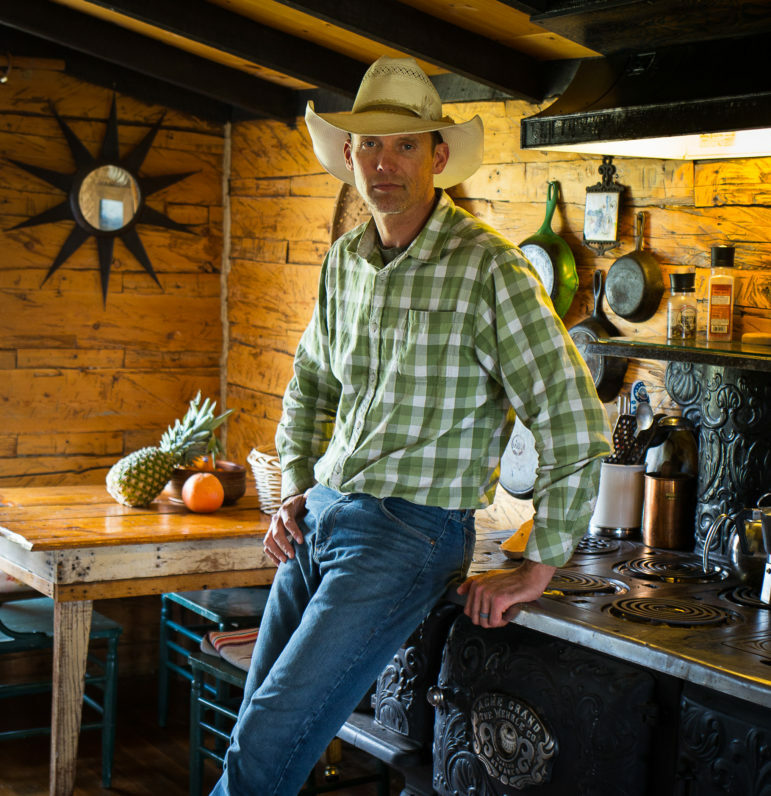 Freddie Botur in his home on his ranch near Pinedale, Wyo. The year 2014 marked a new level of urgency for water managers along the Colorado River. In July, Lake Mead, the nation’s largest reservoir, dipped to its lowest level since it was filled in 1937. Upstream, Lake Powell was also in bad shape. Since 2000, a long-term drought had gripped much of the Colorado River Basin and the storage pool of both reservoirs had shrunk to less than half their capacity. 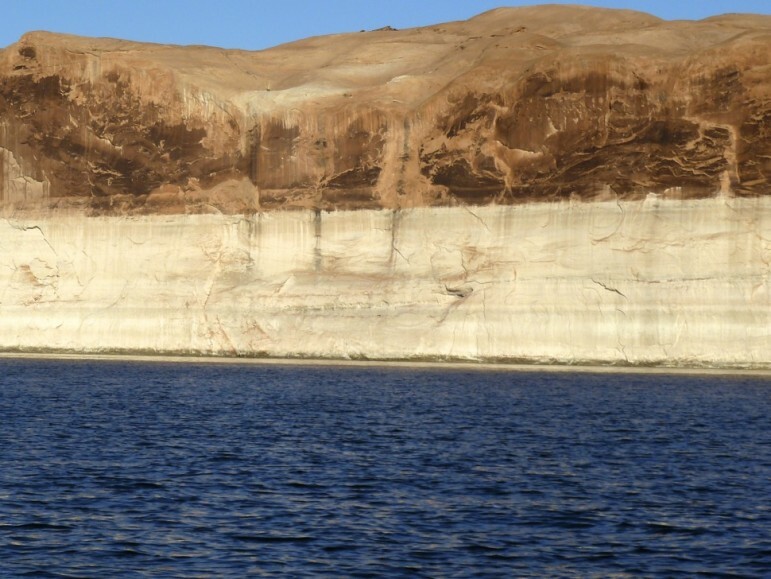 For the first time, federal authorities decreased the amount of water that flows into Lake Mead from Lake Powell. And officials from the Bureau of Reclamation said there was a 50-50 chance that by 2015 Lake Mead’s water will be rationed to states downstream. That, too, had never happened before. Most alarming, however, were the climate models suggesting that the drought was a harbinger of a future marked by rising temperatures — a future in which city water providers could not depend on what’s left in the Colorado River to meet demands. For water officials in the Upper Colorado Basin states — Colorado, Utah, Wyoming, and New Mexico — the ongoing drought posed an additional threat. If they failed to deliver the mandatory volume of water from Lake Powell to Lake Mead, as required by the law, the Lower Basin states of Arizona, Nevada, and California could make a “compact call” for their water, forcing the upper basin to stop diverting post-1922 water rights from the Colorado River. “The cutbacks would go very deep,” says Eric Kuhn, the general manager of the Colorado River Water Conservation District. In Colorado, for instance, the transmountain diversions that pipe water from the western side of the Rockies to the drier eastern side could be limited or stopped altogether. If that happened, Front Range cities — where more than 4 million people live — could lose up to 50 percent of their water supply. And yet, water officials had barely discussed how such a scenario might be avoided. When the first inkling of future water shortages emerged during the 2002 drought, Eklund, who serves on the Upper Colorado River Commission, and other water planners in the Upper Basin, asked the Bureau of Reclamation to model the reservoir levels in Mead and Powell using drier hydrology. The results confirmed what many already knew: They needed to plan for a lot less water in the Colorado River. They could release water from Upper Basin reservoirs to keep Mead and Powell full. They could keep cloud seeding, which may help a bit. And they could keep removing the tamarisk from the banks of the Colorado and Green rivers, and that also may help a little. Still, Eklund, said, it felt like they were “just nibbling” at the problem. Eklund, a fifth-generation Coloradan whose parents operate a ranch near Grand Junction, grew worried. If Lake Powell dropped to so-called “dead pool” levels, the turbines that generate electricity through the Hoover Dam would stop spinning. Without that power, millions of people across the Southwest would see their electric bills skyrocket and the hydro revenue that now pays for environmental programs along the Colorado River like salinity control and fish recovery programs would disappear. In the Lower Basin too, water managers were growing more and more alarmed at the severity of the drought. The year 2002 showed them how fast reservoirs could shrink, said John Entsminger, the general manager of the Southern Nevada Water Authority, which delivers water to Las Vegas and its surrounding urban areas. “That was the wakeup call,” he said. The Green River, near Pinedale, Wyo. The river meets the upper Colorado River in Canyonlands National Park and then the combined rivers flow into Lake Powell. Both cities and ranchers in the seven states served by the Colorado River have grown increasingly dependent on the river over the last century, even as the amount of water in the system is falling. That scarcity has created a complex, often fraught relationship between municipal water providers and irrigators, with cities often buying ranches for their water rights, a practice known as “buy and dry.” They do so from willing sellers, but the remaining ranchers don’t see a benefit and the permanent removal of water from land in a community can bring unwanted change. A similarly tense relationship exists between officials in the Lower Basin and ranchers in the Upper Basin. Fears of Southern California or Las Vegas taking someone’s water are culturally ingrained in ranching communities in Colorado and Wyoming. And in Colorado, a longstanding feud exists between the rural western side of the Rocky Mountains, which has most of the state’s water, and the Front Range, where the majority of the people live. 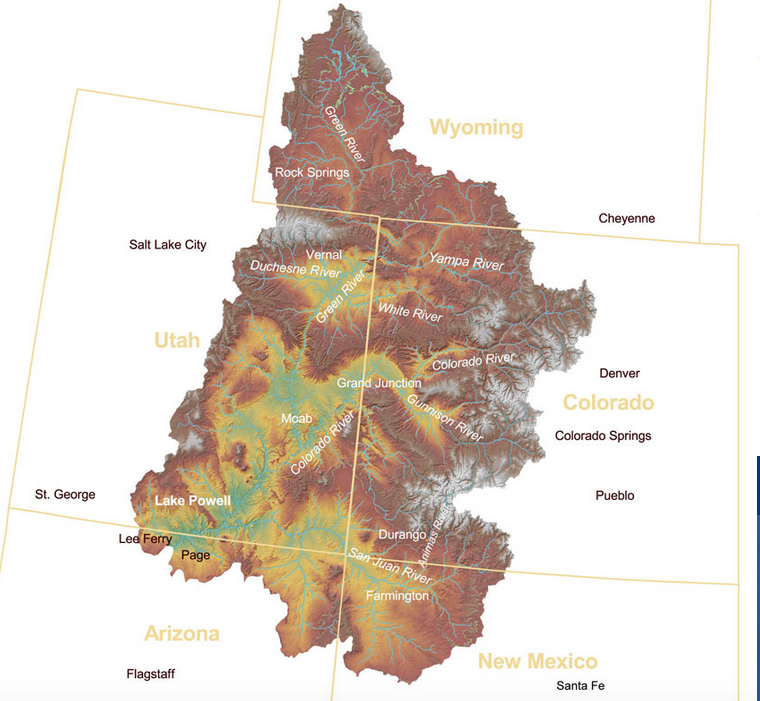 A map of the upper Colorado River basin. One such meeting occurred over a dinner that Eklund hosted for water managers from the basin states and officials from the Bureau of Reclamation and the Interior Department at Denver’s posh Palace Arms restaurant. On the agenda: negotiating Minute 319, a bi-national water-sharing agreement with Mexico, and ways to coordinate drought contingency plans among the upper and lower basin. In the Lower Basin, cities like Las Vegas had invested millions in water efficiency efforts like paying homeowners to get rid of their lawns, imposing strict water restrictions on golf courses, and reusing almost all wastewater. But Lake Mead continued to shrink and Entsminger, whose Las Vegas service area derives 90 percent of its drinking water from the reservoir, grew increasingly worried. San Diego and Los Angeles had been paying farmers in the Palo Verde and Imperial valleys to lease their water on a temporary basis for years – a program that helped meet urban needs without drying up farms. If that strategy could work for California, Entsminger thought, it could also work for other parts of the Colorado River Basin. The seeds of that idea emerged one day in 2013 during a brainstorming session in Hermosa Beach, Calif., with Jeffrey Kightlinger, the general manager of the Metropolitan Water District of Southern California, Chuck Cullom, manager of Colorado River programs for the Central Arizona Project, and Jim Lochhead, the CEO of Denver Water. Together, they came up with what would become the System Conservation Pilot Program, which they hoped would strike a balance between their need to avoid a catastrophic water shortage and farmers’ reticence toward selling off their water rights. Entsminger and the other municipal water managers brought the idea to officials from the Upper Basin states along with the Bureau of Reclamation. In total, they pooled a $15 million fund to compensate people throughout the Colorado River basin for using less water. 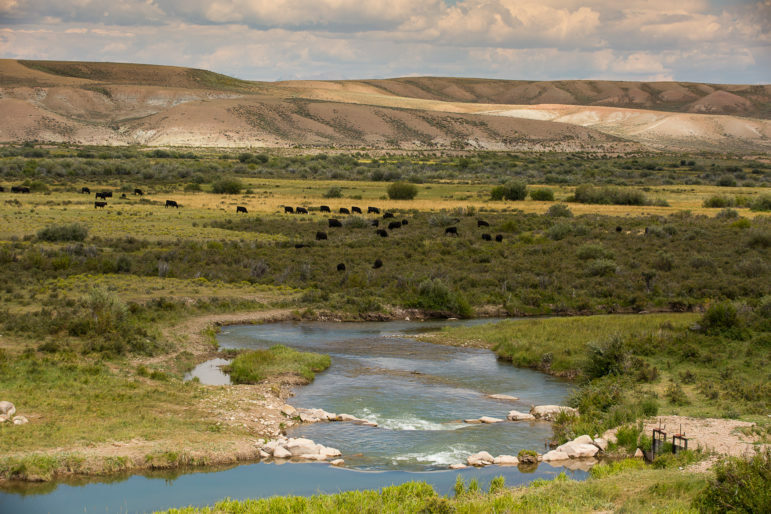 The program targeted ranchers and farmers — who own the vast majority of water rights on the river — but municipalities could apply too. Dennis Schroeder, in one of the hayfields on his large ranch near Pinedale, Wyo. The pilot program worked by soliciting proposals from individuals who volunteered to leave a portion of their water rights unused by letting the water run past their headgates and down their local section of river toward Lake Powell. 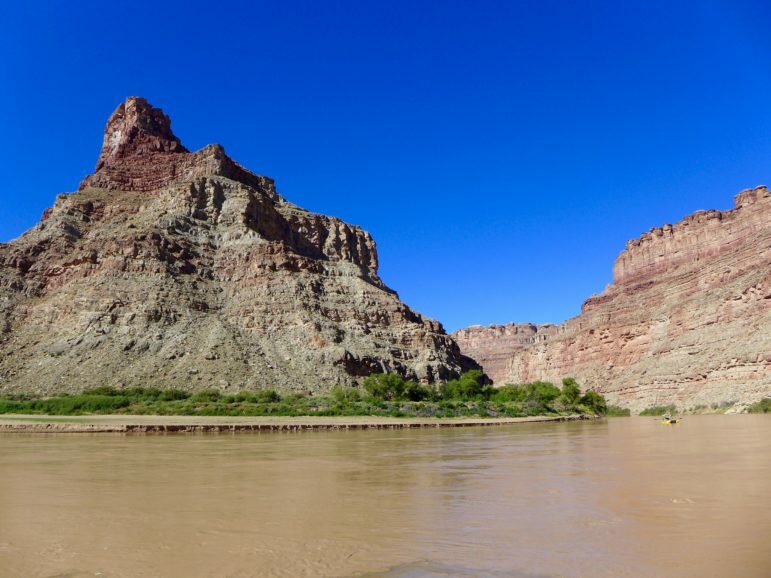 Applicants submitted a proposal describing their intended conservation activities, which were then reviewed by program administrators to ensure the proposals would actually leave more water in the Colorado River system. For instance, low-priority water rights — those dated after 1922 — were unlikely to yield much benefit since during dry years junior water users must stop diverting to allow those with senior water rights their full claim amount. In total, the four municipal water providers contributed $8 million to fund the program, with an additional $3 million from the Bureau of Reclamation. The fund was spread among projects in all seven Colorado River Basin states and when the third year finishes up this fall, according to Michelle Garrison, who managed the program contracts for the Upper Colorado River Commission, it will have left an expected 21,590 acre-feet in the Upper Basin (and almost 98,000 acre-feet in the Lower Basin). True, it is just a drop in the bucket for Lake Powell, which stores water from the Upper Basin of the Colorado River and had 15,020,378 acre-feet in it as of August 27, but it was the principle, and the experience, behind the System Conservation Program, that may prove most important. 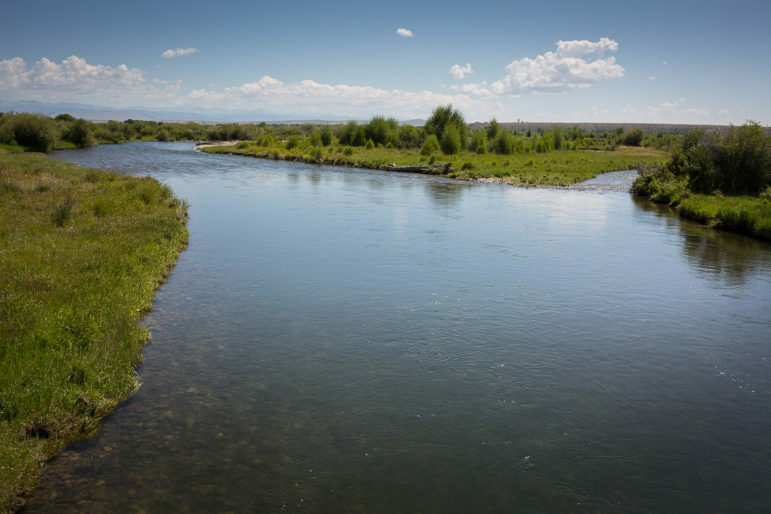 “Nobody really knew how it would go,” said Cory Toye, the Wyoming water project director for Trout Unlimited, about the pilot program. Would farmers and ranchers in the Upper Colorado River basin even agree to participate? For many of them, wary of the legacy of “water grabs” by big cities, accepting money from Las Vegas or Denver would be a form of betrayal to their communities and their culture. Yet Schroeder understood there was a trade-off in participating — turning off his irrigation water early meant he lost out on some hay production — but when he did the math, the deal offered by the pilot program made sense to him. He participated for the first two years, receiving almost $15,000 each year for turning off his irrigation water in mid-July on 81 acres of land, letting 74 acre-feet of water remain in Pine Creek, a tributary of the Green River, which flows into the Colorado. Entsminger knew they would have to tread carefully, that convincing Western ranchers and farmers that Las Vegas was “here to help” would not be easy. The program architects agreed that it would not look good if Lower Basin cities were seen as paying to fallow Upper Basin farms. So officials were careful to n0t fund more projects in the Upper Basin than could be supported by the Bureau of Reclamation and Denver Water, which received funding from the Walton Family Foundation for the program. (Aspen Journalism receives financial support from The Walton Family Foundation). That left funding from the other municipalities, along with the Bureau, to pay for projects in the Lower Basin. To help navigate those cultural sensitivities Eklund and the other program architects also relied on partnerships with Trout Unlimited and The Nature Conservancy. Their staff members would be the messengers, reaching out to irrigation districts and individual farmers with whom they had already worked hard to establish good working relationships. Jackson Ramsay on his ranch. “We were kind of skeptical just because there are so many crazy things happening with government programs,” he told me one afternoon in June at a Starbucks in Rock Springs, before mentioning a rancher he knew who got in trouble with the Environmental Protection Agency for building a pond on his property. Rock Springs is a resource town, surrounded by a honeycomb of old coalmines, the world’s biggest reserve of sodium carbonate, and the huge Jonah gas field. Most locals, said Ramsay, believe that land should be used for multiple purposes and are wary of environmental regulations that might hinder agriculture or extractive industries. “We like coal, we like gas, we like oil, and we like ag,” Ramsay said. Green groups, he added, not so much. Jackson and his brothers first met Walrath seven years ago. But after Walrath offered to replace a headgate that had washed out during a flood, making it better for fish – a project they could not afford on their own – the Ramsay brothers came around to working with a “green group.” Later, Trout Unlimited dug a pipeline to their irrigation ditch to protect it from future floods and the relationship was sealed. When Walrath told them about the System Conservation Program, the Ramsays did some research and decided to apply because it made good financial sense. Ultimately, they didn’t qualify for the pilot program because their fields had not been in production for long enough, but Ramsay told me that they would if the opportunity to participate arose again. Jackson Ramsay, leaning against a headgate on his ranch. The headgate was improved with the help of Trout Unlimited. As the pilot program matured, ranchers and farmers saw a unique opportunity: the ability to diversify their income by marketing their water rights in a way that hasn’t been available before. The first year it ran, in 2015, the pilot program saw 15 applications. The second year, there were 32, and by last year, for the 2017 irrigation season, there were 47 applications. “The third year we were shocked by the number of applicants,” said Garrison. The numbers showed that with the right incentives, ranchers and farmers were much more receptive to helping cities avert a water crisis than any of the program architects had thought. For hay and crops, the going rate was around $200 to $250 per acre-foot mostly for split-season irrigation projects — irrigating only at certain times, or stopping altogether on a certain date. In Colorado, some participants used the program as an opportunity to transition into organic farming, which requires a three-year hiatus from pesticide spraying, while others fallowed certain fields for an entire season. Near the town of Olathe, between Delta and Montrose, Colo., David Harold farms 700 acres of hay, sweet corn, and other vegetables. He learned about the pilot program from a farmer-led coalition called No Chico Brush — named after the woody desert plants that covered vast swaths of land in southwestern Colorado before irrigated agriculture arrived in the late 1800s. The group came together in 2013, a time when farmers in the Lower Gunnison River Basin worried that the ongoing drought might put an end to irrigated agriculture in their region and began researching water-efficiency methods for farms. “I had learned a lot about water rights and I didn’t feel threatened,” Harold said. For Harold, the program made switching to drip irrigation much easier financially. In the past, he had struggled to improve his irrigation efficiency while growing crops at the same time, but participating in the pilot program provided him with some extra income. Not everyone shared that perspective, however. When other farmers learned Harold was signing up, several told him that they thought it was a terrible thing; that it was another form of “buy and dry”; that they would never do it. Others, he said — especially those farmers who were struggling financially — were more receptive. Harold participated for one year, but with his new irrigation system in place, it did not make economic sense for him to continue participating. Still, he believes the pilot program was a worthwhile experiment in figuring out how to value water. The confluence of the Green River, to the right, and the Colorado River, left, in October 2016. Most of the water left in rivers and streams by the System Conservation Pilot Program is headed for this point, directly above Lake Powell. The program helped water managers figure out something essential as well, says Eklund. In an emergency drought scenario, when the usual conservation methods have been exhausted, when upstream reservoirs have been drained, and water levels in Lake Powell are still falling, what else can they do? “How much water can we shove down the river in an emergency – how much money do we need to have ready to go?” Eklund said. But to turn the pilot program into something permanent, Eklund and representatives from the other basin states have some big questions to resolve. For instance, should farmers be compensated for the historical value of water used on their fields or the full potential usage guaranteed by their water right? What if someone like Harold had decided to plant alfalfa instead of sweet corn, which takes half as much water? How much should that contract be worth? How can the program scale to include many participants? How can the contracting process for hundreds of irrigators be effectively managed, as it’s resource-intensive if done one-by-one as it was the past three years, when 56 contracts were produced and signed. Water law, in some states, poses another hurdle. If farmers use less water than their allotment, they could risk losing some of their water rights. In the future, Garrison hopes to see other states adopt legislation like Colorado has, where enrollment in approved conservation programs mean changes in water use cannot cause a farmer to lose a portion of his water right. There is also the question of how to ensure the saved water actually, physically, gets to Lake Powell and Lake Mead, as downstream users are free to divert water in the river consistent with their water rights—whether it was destined for Lake Powell under the system conservation pilot program or not. It’s what Garrison and others call the “shepherding problem.” In other words, how can the water be securely delivered, or shepherded, to Lake Powell without being diverted along the way? But the hardest question to answer is also the one that proponents are reluctant to even ask: Is it even worth it? As Gary Wockner, the director of the river conservation group Save the Colorado, pointed out, the same government agencies supporting the pilot program are also supporting new dam and diversion projects in Colorado, Wyoming, and Utah, that, if completed, would drain a further 250,000 acre-feet from the Colorado River system. For Eklund, that apparent contradiction is part of a balancing act between the need to avoid future shortages on the Colorado River and protect Upper Basin states’ legal right to develop more water — if it’s available. This year, heavy snows in the Rocky Mountains helped offset the years of persistent drought throughout the Colorado River Basin, but new research shows that rising temperatures will increase the frequency and severity of future droughts. Just how much climate change will reduce the Colorado’s flow remains uncertain, but the pilot program at least made one thing clear: Ranchers and farmers are open, despite some negative social pressure, to take good money from metropolitan water providers and in exchange, leave some water in the river. Cottonwood Creek, a tributary of the Green River, as it flows through Freddie Botur’s ranch. The boulders in the river were installed to help create fish habitat and improve the ranch’s irrigation system. 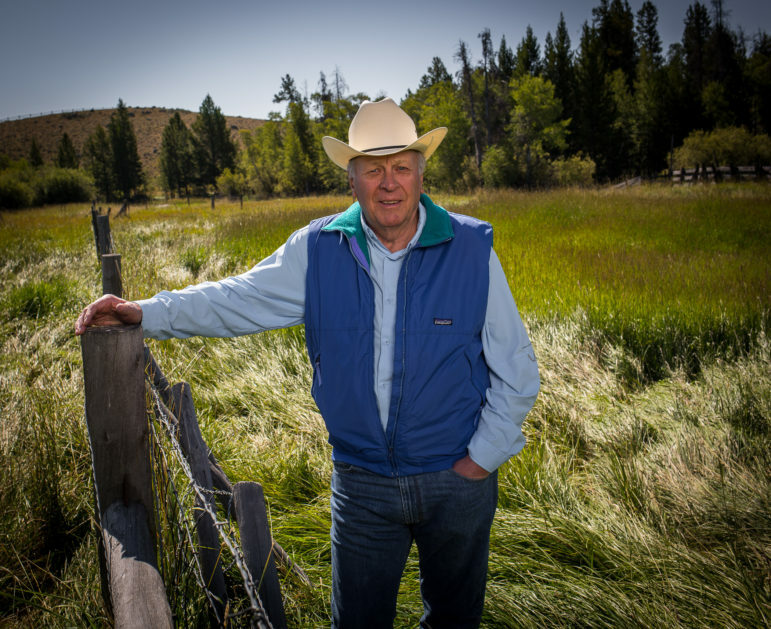 Last May, Botur left his ranch near Pinedale and traveled to Washington, D.C., along with several other ranchers who had participated in the pilot program, and Toye, from Trout Unlimited, to help secure more federal funding and support for the program’s future. The trip was a whirlwind, with 12 meetings in two days, including one in Utah Sen. Mike Lee’s office where they were served Utah’s official state snack of Jell-O with marshmallows. In two years, Botur had gone from skeptic to lobbyist. Faced with looming water shortages, it was better, he believed, to have a voluntary program that rewards people for doing what you want, instead of regulation forcing people to do something they don’t want. Botur shut his water off even earlier than his contract required and other ranchers he knew did too. Water conservation was one value, but there were other values that the program supported and that Botur believed in — conservation of wildlife habitat, fisheries, and overall watershed health. Not to mention the value in avoiding future conflicts that will likely arise from population and climate conditions. “It’s more than just money,” he said. Editor’s note: Aspen Journalism collaborated with High Country News on this story. HCN published the story on its website on Wednesday, Aug. 30, 2017. The Colorado Independent published the story on Aug. 31, 2017. The Aspen Times published the story on Oct. 15, 2017, as did the Vail Daily. The Summit Daily published it on Oct. 16, 2017. Also, please note that on Oct. 31, 2017, Aspen Journalism clarified that a portion of the funding for the SCPP program came from the Walton Family Foundation, via Denver Water. Aspen Journalism also receives funding from the Walton Family Foundation.